Hi everyone! I’m so excited for my first guest post at Just Romantic Suspense! I hope you enjoy it. That’s my version of suspense. The anticipation of what might happen to the hero or heroine and the fear of what horrible thing might be around the next page is what I love about the genre. You know the really great thriller or horror movie you watch with your hands over your eyes? That’s the kind of suspense I love, and that’s what I strive to write. One of the ingredients to a stellar suspense novel is creating an intelligent, fearsome villain. Even better? A bad guy readers can’t help but have a little bit of empathy for. We know he’s a creep, and we don’t want him to win, but he’s so deliciously evil we hope he gets close to his prize so the fun will be drawn out for as long as possible. 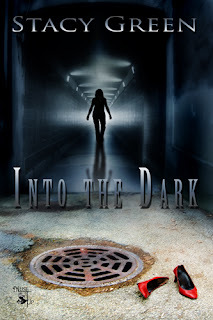 INTO THE DARK’s bad guy is the Taker, an almost ghost-like figure who shocks the famed Las Vegas SWAT team with his plans and eludes police in the filthy storm drains running beneath the city. He’s planned his attack for months, found the perfect spot, and is determined to capture Emilie. And yet … he’s not all bad. He speaks kindly to Emilie and seems to care deeply for her. He talks about history and his own past with reverence, and the sorrow in his voice when he speaks of Josephine might just make you feel a little bit sorry for him. Emilie risked another glance at him. Narrowed in either anger or grief, his eyes glistened with moisture. “She was wrong. All of those exist in the daylight as well. Poor Jo didn’t need to fear the dark. Her bad luck came on a hot, sunny afternoon.” His voice faltered. “That’s none of your business.” Her captor jumped as though jolted with electricity. “Josephine belongs to me and to me alone,” he snarled. lightweight. Breathable. Expensive. Not cheap rags like Joe wore. “Only because you’re scared. But I knew we were connected the first moment I saw you. Buy Into The Dark NOW! To celebrate the release of INTO THE DARK, I’m giving you TWO ways to win a $25 Amazon Gift Card! Both options will get your name into the drawing, which runs from November 5th until the end of my blog tour on January 30th. Entry Option 1: Earns FIVE entries in the contest. Email Stacy your receipt of purchase (simply copy and paste proof of the order into the email, excluding personal information) of INTO THE DARK or the answer to this question: in what state was the Taker born and raised? Entry Option 2: Earns TWO entries in the Contest. Donate to HELP of Southern Nevada and help the homeless. Readers can go to HELP of Southern Nevada, the organization that aids the homeless featured in INTO THE DARK, and donate. Email Stacy the receipt (personal information excluded). No donation is too small! Our passions sound so unhealthy, but I'm fully with you, Stacy. Into the Dark kept me on the edge of my seat. Great post,Stacy. "The anticipation of what might happen to the hero or heroine and the fear of what horrible thing might be around the next page is what I love about the genre." Me too! That's exactly why I love reading and writing romantic suspense. Thanks so much for stopping by, Edith and Kim. So glad you liked the post! Thanks for the post! I can't wait to read this!